An earthquake has struck in western South Carolina on Sept. 13, at around 6:30 a.m. local time, according to the U.S. Geological Survey. 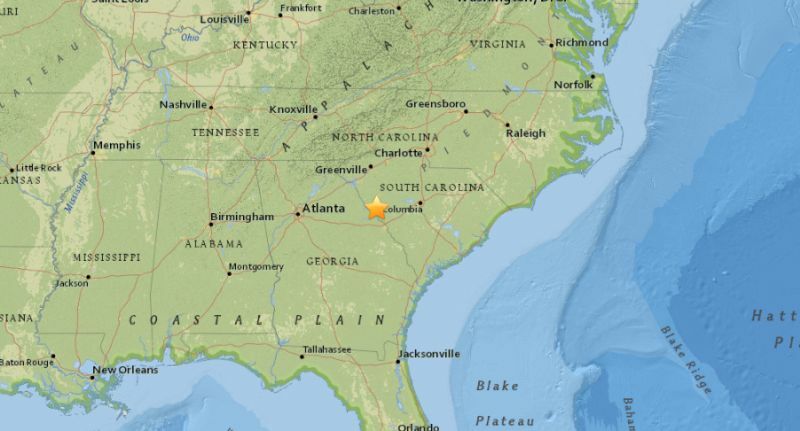 According to The State, the largest quake to hit South Carolina in recorded history was a 5.1, which struck in 1916. It added that Sept. 13’s quake was the fifth to hit the state in 2018. It’s unclear if there were any injuries or if any damage was done. The tremor comes as the state is awaiting the landfall of Hurricane Florence, which is slated to directly impact South and North Carolina on Sept. 14. A storm surge warning is in effect for South Santee River in South Carolina to Duck in North Carolina, and a warning was in effect for Albemarle and Pamlico Sounds, including the Neuse and Pamlico Rivers. A hurricane warning is in effect for South Santee River in South Carolina to Duck in North Carolina, and the hurricane warning is in effect for the Albemarle and Pamlico Sounds, according to the U.S. National Hurricane Center.